What you always wanted to know about DRY EYE DISEASE ... and never dared to ask ! ... What Can I Do Against Dry Eye Disease ? WHAT IS DRY EYE DISEASE ? Dry Eye Disease is a chronic irritation and damage to the ocular surface - the moist tissue on the front of the eye with the eyelids. It is typically triggered by a lack of the tear film on the eye. The ophthalmologist refers to this disease as keratoconjunctivitis sicca, i.e. " dryness inflammation of the cornea and conjunctiva ". THERAPY : => Timely and adequate treatment of dry eye disease is important to avoid permanent damage to vision. The good news is that every patient can do a great deal of self-improvement to relieve dry eye symptoms. The frequency is increased , eg. ... this indicates an influence of hormones and aging processes. Not every dry eye is recognized correctly , because the symptoms are often uncharacteristic at first and the onset is often creeping. What are the symptoms of Dry Eye Disease - How do I recognize a dry eye? This leads to ... " tired eyes ", "heavy eyelids" or "glued eyes"
is even felt behind the eye. Persistent eye irritation can lead to pain and chronic pain can lead to pain syndromes. Chronic Pain Syndromes are a distinct disease factor in Dry Eye Disease and are often difficult to treat. Collaboration with pain medicine and psychosomatics can be helpful here. THERAPY => Visual disturbances in the dry eye typically improve, or even disappear temporarily, after one or several forceful eyelid blinks, that spread a new and stable tear film. - This is also a good test of whether visual disturbances are due to a tear film disorder. Initially, the irritation of the ocular surface can lead to an increased flow of tears (as a protective reaction) ... with an overflow of tears (epiphora) over the margin of the lid. It is of course confusing when the disease of the " dry " eye leads to tear dripping and wet eye. when the outflow of tears into the nose no longer works normally either because the eyelid margin it tilted slightly away from the eye, or because of obstruction in the draining lacrimal ducts. THERAPY => Here, a close examination by the ophthalmologist and maybe a small surgery may be useful. What is the cause of a Dry Eye? - How does Dry Eye Disease arise ? What is the Tear Film ? What does the tear film consist of ? - Of the secretions from the Ocular Glands ! from the secretions of the 3 types of glands on the ocular surface, that produce mainly water but also oil and slime/ mucus. How is the tear film made ? - The Eyelids spread the Tear Film ! from the tear fluid on the eye. must be renewed again and again by a new eyelid strike. Where does the tear film go to ? - The tears are drained into the nose ! with each new blink of the eyelids, the 'used' tears, after bathing the anterior eye, are sucked through the lacrimal punctum on the nasal side of each eyelid and are led to the nose. What is the function of the tear film on the ocular surface ? it is important for a sharp vision. Chronic inflammatory disease such as in rheumatic diseases or in the immune response after bone marrow transplantation (graft-versus-host disease, GvHD). A lack of water is often thought be caused by a reduced production of watery tears through the lacrimal gland. However, a primary lack of water due to a disturbance of the lacrimal gland is very rare. Much more common is (secondary) water loss due to increased evaporation of the tear water on the ocular surface. This occurs in case of oil deficiency and is made worse by desiccating environmental influences. THERAPY => Aqueous eye drops, with or without added oil, are a useful therapy. ... They should be used as needed and often enough, up to 1x per hour. An even more frequent use of aqueous eye drops is usually not useful, as this can reduce the effect of your own (residual) tears and thereby the irritation of the eye can be worse. Most often, not the water of tears is missing first, but the superficial layer of oil on the tear film, which reduces the evaporation of the water. Lack of oil is usually caused by disorders of the meibomian glands in the eyelids . When the glands clog, oil is missing and the watery tears evaporate faster, leaving the eye dry. Meibomian gland disorders are very common and increase with age . ... above all, it is important to improve the function of the oil-producing meibomian glands in the eyelids again ! This is done by a physical lid therapy (with warming, massage, cleansing), which the patient himself performs regularly at home to improve the blockage and damage to the glands. Rare blinking and incomplete blinking are common causes of a tear film deficiency. With rare blinking the tear film is renewed too rarely - it then breaks open and the underlying tissue of the eye becomes dry. In case of incomplete blinking (" nervous blinking of the eye") the eye is not completely closed and thus only the upper part of the tear film is renewed - the lower part of the eye surface remains dry, therefore the first and the most frequent tissue damage is located in the lower half of the cornea and conjunctiva. The Office Eye / Office Eye is a fast-growing form of dry eye in "modern" office work environments . This can add up several harmful effects and thus lead faster to a dry eye. This form of dry eye not only affects the elderly but also occurs more frequently in younger people . Concentrated visual work (eg computer, television, driving) is accompanied by rare blinking and therefore easily leads to a dry eye . In addition to an unstable tear film still drying environmental factors and perhaps negative internal influences on the tear production are added. THERAPY => My observation and, if necessary, change of the eyelid are important here, for a sufficiently frequent and complete eyelid strike. Furthermore, deliberate Blink exercises at work can be useful - there are even computer apps to remember. Furthermore, avoidance to dry working environments, sufficient breaks and sufficient drinking volume are helpful. A tear disorder induces or exacerbates the irritation of the ocular surface. An irritated ocular surface, in turn, worsens the stability of the tear film on the damaged ocular surface. Tear Deficiency and and Ocular Surface Tissue Damage are obviously linked by a so-called "Vicious circle" where the dysfunction of one makes the other worse - which then reinforces the starting event ... and so on. Therefore, dry eye disease has a tendency to aggravate itself if not treated adequately. If the ocular surface is permanently irritated, as is typical in the dry eye, then this can trigger an inflammatory reaction. The inflammation is actually the defense of the eye. But if the inflammation occurs permanently, then it can increase the self-aggravation of the dry eye. THERAPY => here an anti-inflammatory therapy by the ophthalmologist may be useful. The ophthalmologist you trust and, for severe cases, even in specialized Sicca centers, there are even more therapy options available. ... that makes everything easier to understand! Welcome to the International Condensed Version of the OSCB Information WebSite which is perfect for your START and immersion into the topic ! This happens typically following a Deficiency of the Tear Film in front of the eye. It can then no longer keep the delicate tissue sufficiently moist ... with the consequence that the Tissue dries out - This is the reason behind the term "DRY EYE"
The so-called ´DRY´ EYE DISEASE is a very wide-spread condition ... and it represents the most frequent diagnosis in clinical practice. In contrast to the term "Dry" the occurring irritation of the ocular surface tissue may also lead to episodes of excessive tearing and watering eyes. This occurs particularly in the initial stage of this condition and is often difficult to understand for the patient. DOCTOR, MY EYES ARE WATERY ... HOW CAN THAT BE ´DRY´ EYE DISEASE ??? An increased tear flow in case of watering eyes can indicate a (still) intact protective tearing reflex. This reflex is generally triggered by irritation of many kinds such as e.g. wind and fans, or foreign bodies etc. Such irritating incidences make the tears flow to remove the stimulus. Another reason for watering eyes with tear overflow over the eyelid border, medically termed as ´epiphora´, can occur due to eyelid deformations. Because eyes with eyelid deformations cannot form a normal tear film or cannot hold it on the ocular surface these conditions also lead to Dry Eye Disease with ocular irritation. Frequent eyelid deformations are e.g. an inward or outward twist of the eyelid margin (ectropion or entropion) that typically occurs with tissue changes in advancing age. ´Tricky´ is not only the fact, that an eye in ´Dry Eye Disease´ can be watering. Tricky is also the fact that... surprisingly ... most patients with ´Dry´ Eye Disease do not have a primary lack of water but they have a primary lack of oil in the tear film. The oil on the surface of the tear film has the function to slow down the evaporation of tear water ... similar to a lid on a pot with warm water. The healthy function of the Ocular Surface depends on a large number of factors that are inter-related and inter-dependent. Science is working on the resolution of ocular surface disease - of which Dry Eye Disease is the most frequent one - for quite a while ... and researchers world-wide have made considerable advancements of knowledge. This has translated into benefit for the daily lives of hundreds of millions of patients world-wide who suffer from Dry Eye Disease . But even deeper insight into the disease process and thus continued scientific advancements are necessary to offer more effective strategies for therapy in the future. IMPORTANT for the patient is to UNDERSTAND his/her CONDITION ... in order to understand the many ways to influence the condition in a beneficial way. ... at the INFORMATION PLATFORM on the OCULAR SURFACE and DRY EYE DISEASE of the OCULAR SURFACE CENTER BERLIN (OSCB) - A non-profit Science Institute for the advancement of knowledge on the Ocular Surface and Dry Eye Disease that is set up and run by experienced scientists in the field. ... that maintains the permanent Moisture of the Ocular Surface. Moisture is necessary for the health of the ocular surface tissue and moisture is also important for perfectly clear vision. Without sufficient moisture the vision becomes blurry, the tissue is increasingly damaged, and sensations of discomfort occur. ... that later allow the ´curious´ Brain to construct an image of the outside world on the screen of consciousness. Our Ocular Surface has the biological requirement that it must be permanently moist - ´always and everywhere´ - to keep the transparent window of the cornea indeed clear. The Moisture is produced by the associated Glands of the Ocular Surface and it is termed as the ´Tears*. Since we are living in a dry environment with an air atmosphere, it is actually quite laborious to preserve this little artificial moist ´ecological niche´ of the Ocular Surface - ´always and everywhere´ ! The Tear Fluid is produced by several Ocular Glands. There are three different types of glands needed, because the tear film on the eye consists of three different types of substances. Water ... is the main part of the tears and comes from the lacrimal gland behind the upper eyelid. Several small accessory glands contribute minor amounts of fluid. Oil ... from the Meibomian lipid glands, that form elongated strands inside the eyelids, can reduce the evaporation of the water. Oil therefore forms a thin layer on the surface of the tear film. Mucus/ Slime ... comes from individual small goblet cells in the mucous membrane of the conjunctival sac. They can be seen as little dots in the microscope. The Slime is needed to connect the water of the tears to the cell surface. Tears are produced by the various Glands at the Ocular Surface. The bulk volume consists of water and comes from the lacrimal gland that is located upstream in the upper lateral side of the bony orbit. From there the tears enter the conjunctival sac. They are flowing over the visible anterior part of the eye and thus constantly bathe this area. At the nasal side the ´used tears´ are sucked up by two narrow lacrimal puncta, one at each nasal end of the upper and lower eyelid. Through the lacrimal drainage system the tears enter the nose. When tears go there in larger quantities, e.g. in emotional crying, they may flow backwards into the pharynx where we can sense their salty taste. Meibomian oil protects the tear water from evaporation. The Meibomian glands produce lipids that are liquid at body temperature and thus form an oil. The glands are of particular importance for the health of the ocular surface because their oil retards the evaporation of the tear water from the lacrimal glands. In the dry environment that we live in, even a copious secretion of tear water would rapidly evaporate from the ocular surface if it was not protected by the superficial Meibomian oil layer on the tear film. The Meibomian glands form individual long bodies that fill the tarsal plates of our eyelids. About 25-30 glands can be found in every healthy eyelid and the little orifice is close onto the posterior lid margin ... as can be seen in an ordinary mirror, by everybody who is interested. With every blink of the eyelids a little drop of oil is expressed by the lid muscle. It gets from the gland onto the eyelid margin and the tear film. where it protects the aqueous tear film from too rapid evaporation. ... on the other hand, opening of the eyelids would at the same time immediately deprive the Ocular Surface tissue of its moisture and it would start to dry out. To solve this Dilemma, the Ocular Surface has to apply a ´Trick´: A very narrow layer of fluid is formed from the tears - this is for obvious reasons termed as the Tear Film. The Tear Film is thick enough to preserve the moisture for the underlying cells of the tissue but not too thick in order not to harm the transmission of light. The Ocular Surface in fact manages to be even more ingenious, because it solves the dilemma by even improving the passage of light through the presence of the Tear Film. The Tear Film fills in all subtle inequalities of the ocular surface and thereby provides a perfectly Smooth Surface layer for perfect refraction of the incoming light that allows for perfect Visual Acuity. The Tears are transformed into the thin, homogeneous Tear Film ... through the coordinated Movement of the Eye Lids - the BLINK. During the blink mainly the upper eye lid wipes over the anterior surface of the eyeball and thus distributes the tears into the very narrow Tear Film. During the down-phase of the blink the old tear film is removed by the upper eyelid and during the up-phase the upper eyelid draws out a new intact homogeneous tear film. It becomes obvious that any disruption of the EyeLid and of their normal Blink movement and speed is an important factor for the onset on a Dry Eye condition . This is termed as ´Eyelid and Blinking Disfunction´ (abbreviated as LBD). Only through the coordinated blink movement of the eyelids, together with the very special composition of the Tears , is it possible to form a TEAR FILM that is extremely thin (only about one hundreds of a millimeter). At the same time this very narrow tear film must still be stable to allow the curious brain to achieve a sufficiently sharply focused image of the outside world. The Tear Film must be stable for at least 10 seconds on average until it eventually breaks up and triggers a stimulus that induces a new blink that forms a new tear film. Having said this ... all major things are basically named ... The basic functional pre-condition at the ocular surface for vision is a Stable Tear Film. This is achieved by the Basic Functional Complexes of Tear Secretion/ Production by the ocular glands and of the physical Tear Film Formation by the blink movement of the eyelids.
. . . ´After the MOIST is gone´ . . . The formation and preservation of the Tear FILM is very laborious in the dry environment that we live in, and is thus very vulnerable. The Tear Film depends on a multitude of very different Influence Factors, that can, in one or the other way, have a positive or negative influence. All negative influence factors are Risk-Factors - they can, sooner or later, lead to a Dry Eye condition - particularly when they become chronic. The large number of influence factors that may appear unrelated at first glance can let Dry Eye Disease appear as a ´Tricky Condition´ - even though it basically straightforward. The Tear Film has the function to prevent Drying of the Ocular Surface Tissue. Therefore the most immediate consequence of a Dry Eye condition is typically the Drying and thus Destruction of the Ocular Surface Tissue. The eye lids can then often be sealed by sticky mucus and encrustations. This results in a ´downstream´ irritation of nerve fibers They transmit ocular irritation of various degrees and can lead to pain that is often described on and around, occasionally behind, the eye. Inflammatory reactions can reinforce the whole process, eventually leading to severe tissue destruction and to a chronic pain syndrome. According to the present scientific knowledge, the vast majority, i.e. four of five patients with a Dry Eye Condition, does NOT have a primary lack of water but instead a PRIMARY LACK OF OIL in the tear film. This leads to increased water evaporation and decreased tear film stability .... with a secondary water loss. Therefore, in most patients, it does not seem to make much sense nowadays to use products that do not contain lipids in one or the other way. It may be possible to replace the effect of lipids on the tear film by other compounds, or to simply use lipids only, e.g. as a liposomal spray. ... In other words, LIPIDS or respective compounds should nowadays be a component of a typical Tear Supplementation Therapy. The lack of oil on the ocular surface is typically due to Meibomian Gland Dysfunction (MGD), a mostly obstructive condition of the Oil-producing little glands inside the eye lids. The glands are blocked by inspissated secretum and excessive keratinization - therefore inspissated oil accumulates inside the glands. Muscular force during blinking of the eyelids normally helps to express the oil from the Meibomian glands. Rare Blinking is thought to be an important factor for a lack of oil on the tear film and possibly a co-factor for onset of gland dysfunction. Intended forceful blinking is known as a simple way to increase the oil layer on the tear film and thus to improve tear film stability in order to prevent ocular surface dryness. How to TREAT Dry Eye Disease ? In most cases there is a deficiency of the Tear FILM based on a qualitative or quantitative lack of Tear Components. Therefore TEAR SUPPLEMENTATION, i.e. the addition of missing tear components - in the form of eye drops or of a spray - is the most frequently used therapy option. Sometimes this is termed Tear ´Replacement´ - but, since the (full) Tears with all ingredients can (unluckily) not be replaced at present and in the foreseeable future, the term ´Supplementation´ appears more appropriate. All different sorts of eye drops based on aqueous solutions with a lot of different additional ingredients are available, mostly as prescription free over the counter products. Physical Eyelid Therapy options refer to the fact that the improvement of Eyelid and Meibomian Gland Disease is based on simple but effective physical techniques such as Warming and Moistening, as well as manual Massage and Expression of the Glands with subsequent Scrubbing and Cleaning of the Eyelid Margin. It is certainly important to note that before any manipulations are done to the eyelids and the eye a clinician should always be consulted for an educated diagnosis and for therapeutic recommendations ! It appears necessary that Physical Therapy is done as a permanent therapy, at best twice a day - because a chronic disease typically requires a chronic therapy. Only a chronic consequent therapy is able to improve the disease condition - still, there is typically only a slow but steady improvement ! serves to re-liquefy the inspissated oil inside the Meibomian glands. In order to achieve 40°C inside the eyelid a slightly warmer (42-45°C) moist warm compress/ cloth must be rewarmed (e.g. from a larger bowl of hot water) every two minutes as shown by studies. The additional moisture serves to soften up the cornified epithelial squames and lipid encrustations on the eyelid margin. anyway, as mentioned earlier, in a chronic disease, such as Dry Eye Disease, a chronic therapy is necessary to improve the condition. A single treatment can typically not result in any major progress. Therefore even a correct careful eyelid massage does not necessarily result in a noticeable expression of inspissated Meibomian lipids. But consequent therapy will result in steady improvement of the disease condition. when the oil is very hard and insufficiently re-liquefied it may be necessary to perform a more vigorous expression of the eyelid , e.g. between two fingers. during any procedures applied to the eye by a layman it must therefore alway be safeguarded that no harm and wounding is caused to the eye, eyelids and glands ! Lid Margin Hygiene can be done by a soap-free wiping or ´scrubbing´ of the lid with a cotton-tipped rod or a cosmetic pad in order to remove any debris, encrustations and foam from the lid margin. it appears important to avoid any soap, shampoo, or any other detergents, as has previously occasionally been recommend., because that would conceivably harm the tear film lipid layer. Oily solutions of any kind appear more suitable for eyelid cleaning. Commercial eyelid cleaning kits are available that contain everything necessary in a pre-prepared set and may make eyelid hygiene much easier. The advantage of such physical therapy options is certainly, that this can mostly be done at home by the patients themselves. It may appear as a disadvantage that physical therapy and in particular lid hygiene has to be done routinely once or twice a day, similar e.g. to tooth brushing, but requires slightly more time. Various other THERAPY OPTIONS are discussed in other Chapters of the full length English Language Pages of the OSCB Information WebSite. Contact Lenses are in fact sitting in the middle of the Ocular Surface Functional Unit - with potential influence on all tissues and on the tear film. Contact Lenses thus have a somewhat ambiguous role for the Ocular Surface - with Pros and Cons. Contact Lenses can be used for medical purposes such as the optical correction of an irregular corneal shape or for the protection of the eye e.g. in severe cases of Dry Eye Disease. It may well be, that an individual with a borderline normal tear film, who is still without symptoms, may develop Dry Eye symptoms upon insertion of an ordinary soft hydrogel contact lens. A typical side effect of Contact Lenses is therefore the onset of Dry Eye symptoms and eventually probably of Dry Eye Disease. On the other hand an individual with a severe Dry Eye Disease may profit from the application of a special so-called ´Scleral´ Contact Lens that is able to preserve the tear solution underneath the contact lens and in front of the cornea. MOISTURE comes from the Tears and is produced by the Ocular Glands - but it must be spread into a Tear FILM by the BLINK Movement of the Eye Lids ... to make moisture PERMANENT - Everytime and Everywhere ! The Glands of the Ocular Surface for the production of the dfferent components of water, oil and slime/mucus together form the tear fluid. The Tears are the essential medium for the provision of moisture at the Ocular Surface. The Tear Film makes it possible that moisture can even persist on the tissue within the opened palpebral fissure. In addition to moisture the Tear Film aids in allowing a perfect light refraction and thus a perfect vision at the same time. DAMAGE of the ocular surface tissue is the other basic pathology in Dry Eye Disease. It typically results from Tear Film Deficiency of any kind. A deficient, unstable tear film layer can no longer protect the surface tissue. Therefore the very susceptible surface cells will then immediately start to develop drying alterations that damage the tissue. Rarely does Surface Damage occur as a first pathology due to a different pathology such as, e.g. in a severe malnutrition with Vitamin A or due to inflammatory local or systemic disease conditions, such as in Graft-versus-Host Disease (GvHD). In less developed regions of the world, however, pathologies such as malnutrition and inflammatory disease can be more frequent. A Dry Eye can thus occur more often due to a primary Tissue Damage which then deteriorates the Tear Film. Basic causative factors lead to Tear FILM Deficiency that induces the primary pathology of Tissue Damage. Such patho-physiological analysis of the disease process in Dry Eye Disease led to the ´Holistic Dynamic Concept´ of Dry Eye Disease as described in the Dry Eye Chapter of the original full length English language version of the OSCB WebSite. Instability of the Tear Film is a typical feature of any type of Dry Eye Disease and thus important to be investigated. this parameter is termed "Tear Film Break-Up Time", typically abbreviated as "BUT"
it is typically and easiest determined by applying the vital stain fluorescein into the tears. The FBUT Test has therefore been used for decades with great success. Meanwhile non-invasive methods (NIBUT) are gaining increased interest where the tear film break-up is detected by changes in its reflection, which is slightly more accurate in principle but requires specific technical equipment. vital stains bind to the altered surface and thus result in little stained spots where damage has occured. Ocular surface damage is a typical characteristic of ocular surface disease and in particular of Dry Eye Disease. The degree of vital staining therefore shows the degree of ocular surface damage. Surface staining in the temporal part is the inter-palpebral zone is thought to be more characteristic for Dry Eye Disease than a more nasal staining. What are the SYMPTOMS of DRY EYE DISEASE ? Tear Film Deficiency and Surface Damage lead to typical subjective irritative SYMPTOMS of the patient. Typical Syptoms in Dry Eye Disease are e.g. ocular irritation, dryness and grittiness, often described as ´heavy eye lids´ or ´tired eyes´, together with an unstable visual acuity and episodes of blurred vision, with various degrees of irritation and pain. Initially the ocular irritation due to tissue alterations can lead to episodes of increased tearing, watery eyes and tear dripping over the lid margin. An often underestimated Risk Factor for the promotion of Dry Eye Disease is various types of medication. This is true in addition to the potential negative influence on ocular heath that may come from the presence of systemic disease as such, that may require the medication. Pharmacological therapy may promote the onset or progression of Dry Eye Disease when they change the internal milieu of the body in a way that has a negative influence on the production of tear components. Another issue occurs when they have a direct negative influence on the health, vitality and integrity of the ocular surface. The latter can occur e.g. in malnutrition of e.g Vitamin A, and in chronic inflammatory ocular surface disease as e,g, in Graft versus Host disease (GvHD) that as typically observed after bone marrow transplantation. The medicine-related and often pharmacological negative influence on the health of the ocular surface and on the promotion of Dry Eye Disease was in the recent (2017) TFOS DEWS II Report designated an own type of disease, the ´Iatrogenic Dry Eye´. Many classes of pharmacologicals are known or supposed to promote Dry Eye Disease. This includes, e.g. The potential promotion of dry eye disease depends, however, on the actual medication and on the dosage. An intended necessary positive drug effect on the disease in question certainly has to be weighed against a potential unwanted side effect in order not to endanger the health of a patient. Generally, a medical therapy that is advised by a doctor should not be changed of removed by a patient without better knowledge ! A direct damage of the ocular surface occurs in particular by the chemicals that are added to eye drops as a preservative in order to prolong the shelf-life and their time of usage by the patient. This is a problem in particular when the eye drops have to be applied frequently or regularly as in tear supplementation therapy and topical glaucoma therapy. Frequent application of preservatives often leads to a considerable damage of the fine structure of the ocular surface and thus to decreased wetting of the tissue and to instability of the tear film. Luckily many eye drops are available today in a preservative free form either in small Single Dose Containers or in sterile drop dispensing bottles. Whenever possible such preservative free medication should be preferred. Tear Film Deficiency and Surface Damage influence each other negatively and are therefore linked by several self-enforcing vicious circles that lead to worsening of the condition. are a typical component of Dry Eye Disease because inflammation represent a basic protective mechanism of wounded tissue - and this is also true for the Ocular Surface. When the wounding becomes chronic the inflammatory answers of the tissue also become chronic and more severe. Inflammatory pathways are thus an important disease mechanism for worsening of the condition in chronic ocular surface disease. Schematic diagram of a typical medium sized Soft Contact Lens on the Eye and partly behind the Lids. These lenses are termed corneo-scleral contact lenses because they reach over the cornea onto the sclera.. This is the most widely used type of contact lenses. Contact Lenses can correct refractive errors directly on the cornea and therefore, they have some principal optical advantages compared to spectacles. Soft lenses can typically be worn without distinct irritation and thus often require no adaptation time for the wearer to get used to a lens. This may be a reason why most Contact Lenses are of the ´Soft´ type and are not worn for medical but for esthetic/ cosmetic reasons. ... but contact lenses still represent a ´foreign body´ for the Ocular Surface Tissues and Tear Film. Even though contact lenses are typically ´swimming´ in the tear film it is still inevitable, that they are in mechanical contact with the ocular surface tissues. A typical side effect of contact lenses therefore is the occurrence of increased frictional forces to the ocular surface tissues. The fine structure of the surface epithelium may undergo a deterioration where it is exposed to the influence of a Contact Lens. Shown here is the change of the bulbar conjunctival epithelium in the excursion zone of a soft Contact Lens. The cubical surface cells with interspersed goblet cells for the production of water-adhesive mucins are replaced by a squamous epithelium without goblet cells in a process termed ´squamous metaplasia´. Although fitting principles usually try to avoid too much physical ´touch´, contact lenses are still, inevitably, in contact with the ocular surface - just as their name suggests. Contact lenses can thus have mechanical, physicochemical and chemical impacts on the Ocular Surface to varying degrees. Even though such contact lens impacts on the ocular surface may not necessarily be pathologic, they may still contribute to that is known as ´Contact Lens Discomfort´ (CLD). CLD refers to a vague irritative discomfort by sensing the presence of a contact lens on the eye and CLD was the topic and title of the 2013 TFOS report on such Contact Lens impacts on the Eye. The conjunctival areas on the eyeball and on the back side of the lids are less sensitive, but are also in touch with the contact lens and are thus exposed to potential negative influences. It is known for decades that chronic friction by a contact lens may negatively influence e.g. the fine structure of the conjunctival surface and thus reduce the wettability of the ocular surface. A typical side-effect in long-term contact lens wear is the potential development of Dry Eye symptoms of varying degrees. It is shown that the structure of the bulbar conjunctiva changes in contact lens wear. This occurs in the zone where the margin of the contact lens is in touch with the surface and rubs over it upon every movement of the eye. The type of epithelium changes, termed as squamous metaplasia, and the number of goblet cells that produce the important mucus for the wetting of the surface, decrease in number. These alterations deteriorate the wetting of the Ocular Surface and promote the onset or worsening of Dry Eye Disease. Apart from the fact that Contact Lenses can exert unwanted side effects on the ocular surface and tears Contact Lenses can also be used as a medical tool in selected cases. Several types of Speciality Contact Lenses exist that can be used as medical tools in selected medical conditions for patients who are in continuous clinical control. This refers to ´Rigid´ Contact Lenses that can correct higher degrees of corneal shape distortion (as occurs in higher astigmatism and in keratoconus) where the visual acuity can not be sufficiently corrected by spectacles. ´Rigid´ Contact lenses can also be used for intended changes of the corneal shape, termed as ´Orthokeratology´ in order to avoid day time wear of spectacles - which certainly needs close clinical monitoring. ... Speciality Contact Lenses (Scleral Lenses) can be used as a medical tool in patients with severe Dry Eye Disease. Scleral Contact Lenses provide a protecting translucent cover over the sensitive cornea and constitute a moist chamber that preserves the patient´s few own tears under the vault of the contact lens against evaporation. This can typically restore ocular surface healing and visual acuity. Modern contact lens types can often reduce many of the potential negative impacts on the ocular surface by technical improvements - An issue that is still relevant is, however, the HYGIENE. When basic rules of hygienic contact lens wear are not respected this can still result in dangerous ocular infections that may endanger vision. Even with application of the most advanced medical therapy, a severe contact lens related corneal infection may eventually and tragically lead to a loss of the eye. Bacteria are typically introduced through the handling of the contact lens by the wearer and/or by use of contaminated tap water. Bacteria accumulate in the contact lens containers or in difficult to remove deposits on the contact lens itself. The occurrence of infection is further promoted by the inevitable occurrence of tissue microtrauma of different kind in contact lens wear. This provides a route of entry through the normally almost impenetrable ocular surface barrier. Particularly inexperienced Contact Lens wearers are at risk for serious ocular infections. Furthermore patient groups with a reduced level of immune defense such as children and elderly people are particularly susceptible to ocular surface infections. The increased use of daily disposable contact lenses contributes to a decrease in ocular infections. because the critical steps of cleaning and storage of a worn lens become obsolete. The continuous Turnover of Tears at the Ocular Surface goes (1) from their main production in the lacrimal gland over (2) the readily visible cornea and conjunctiva that they must constantly bathe into (3) the lacrimal drainage system that drains the tears into the nose. The Tear FLUID, usually simply termed as ´TEARS´ is produced/ secreted by the Glands of the Ocular Surface. ... the tears are discharged from the bulbar surface into the lacrimal drainage system towards the nose. Also, the regulated disposal of ´used tears´ from the ocular surface is very important because there is very little space on the ocular surface for fluid. In contrast to a real DRY Eye, with a definite lack of tears, the increased production of tears as seen in an irritated ´Watery´ Eye ... or, a decreased disposal of tears from the ocular surface, as seen in an abnormal eyelid shape termed as ´ectropion´ can also lead to problems. Both of these conditions with ´too many tears´ at the ocular surface typically lead to a (continuous) dripping of tears over the lid margin, that is termed ´epiphora´ by the clinician. So ... we can see that the ocular surface is not too different from our experience in daily life - too much can be equally tiresome as too little. A glimpse into the TEAR FILM. The main phase of the Tear Film overlying the transparent cornea is composed of the aqueous fluid from the lacrimal gland. Below are the numerous finger-like protrusions of the surface cells. Their cell bound and and loose secreted mucins (pink filaments) constitute the basal mucin layer that binds the tear water to the ocular cell surface. Mucins mix with the water and together they form a water-mucin gel. The surface of the Tear Film is covered by a very narrow oil layer from the-lipids of the Meibomian glands. The lipid layer has the same thickness and coloring as an oil film on a puddle of water. A main function of the oil layer is to retard the evaporation of the aqueous main phase of the tears. Consequently a lipid deficiency due to a dysfunction of the Meibomian glands is presently reported as the main causative factor for Dry Eye Disease. What is the role of the Eyelids? => They spread the essential pre-ocular Tear FILM ! The wiping movement of the upper eyelid during the blink spreads the tears into the thin and homogeneous Tear FILM. Of particular importance at the eyelid margin is the posterior lid border because this is the structure that distributes the tears into a very thin film of tears. The posterior lid border acts similar to the wiper blade at the windscreen of car. It is therefore termed the lid wiper. ... but, at the same time, the tear film is the main surface for refraction of the light to provide perfect vision. 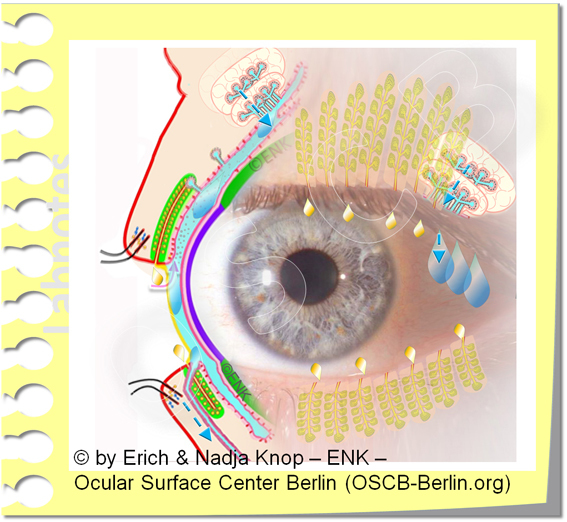 Another function of the blink is that the force of the lid muscle expresses some oil from Meibomian oil glands inside the Eyelids. A lack of blinking therefore leads to a lack of oil on the tear film and to its instability. ... consequently an alteration of Gland function and/ or of Eyelid function may lead to a Dry Eye condition - if this occurs chronically it may result in Dry Eye Disease. In addition to spreading the Tear Film from the tear fluid, the eyelid action during blinking also contributes to the drainage of the used tear fluid via the lacrimal drainage system into the nose. => The Healthy Ocular Surface is a Pre-Requisite for Vision ! => Typical subjective SYMPTOMS are various degrees of Ocular Dryness, Blurred Vision, Irritation and Pain ! e.g. intermittent blurred vision that comes and goes and becomes better upon enforced blinking - which is good evidence that the symptoms indeed derive from a Dry Eye condition. => Typical objective Clinical SIGNS of Dry Eye Disease are a reduced a reduced tear film stability and/ or tear volume on the ocular surface that reduce the moisture of the tissue and lead to surface damage ! A moderate DRY EYE typically shows only mild redness of the Conjunctiva and Lid Margins that may indicate an inflammatory condition as described by the term ´Keratoconjunctivitis sicca´. The orifices of the Meibomian oil glands are often obstructed by visible or invisible inspissated secretum (which represents the most frequent primary cause of Dry Eye Disease). The tear volume is low due to water evaporation and the tissue of the Ocular Surface epithelium has many small defects, that occur as small spots in vital staining with a green stain (fluorescein) observed in blue light. The lack of sufficient tear fluid or a lack of a sufficiently stable Tear Film, that is often caused by a Dysfunction of the Meibomian Glands (MGD), results in the pathological SIGNS of the Dry Eye Disease. => ... this is not completely clear as yet and still an issue of ongoing scientific investigations 1! In Dry EYE DISEASE there is often a Disparity between subjective Symptoms of the Patient and the objective clinical Signs points to some considerations on the neurobiology. The processing of signals from the Ocular Surface is complex and is influenced on different levels of the nervous system. Therefore, the outcome depends on many variables and may very well be different in different individuals. This fits well with the observations from our daily lives, that different people tend to have different ´nerve costumes´ and may react differently to the same stimuli. Another issue is, that there is a principal difference between a ´perception´ e.g. of touch in a peripheral organ, such as the cornea, and the allocations that subcortical centers add to it in order to produce something that we call pain. PAIN is not a mere perception but is basically more of a feeling, i.e. a construction of the brain, because it contains an emotional aspect that the brain allocates to an incoming afferent impulse from the periphery. The emotional aspect that the brain allocates to the stimulus is based on very individual things like previous experiences, recent emotions, or future expectations ... in order to name just a few factors. Therefore the actual feeling that is generated in the brain can vary to a large degree in different individuals. This may point to a neuro-biological explanation of the disparity of signs and symptoms in Dry Eye Disease. However, for the respective individual, the two different neurobiological authorities of "perception´ and of ´pain´ are not always clearly discernible ... and it is not always clear which of the authorities is more ´real´ and thus trustworthy. Pain has the biological sense to alert us in order to avoid dangers that may threaten our health or our life. Under certain conditions when a pain becomes chronic and when it leads to a damage of the nervous system itself, it can develop into a chronic PAIN SYNDROME. Pain has then lost its biological function and becomes a disease of its own. In such cases where chronic pain persists without an identifiable tissue damage it may be useful to seek the help of a pain specialist. The subjective emotional rating of a sensation may very well dominate over the pure perception ... or reverse. In some cases intense subjective symptoms are causing a severe suffering of the patient whereas the clinical investigation may only observe few minor manifest alterations or even now pathology - this may probably point to a potential chronic pain syndrome. On the other hand there may be a patient who in fact has severe objective alterations of the normal structure and function but does not suffer from any severe symptoms or may probably have no symptoms at all. Such a patient may then have only a limited interest in therapeutic interventions even though these may be very advisable from a clinical perspective. Psychosomatic Influence on a disease process and on its self-perception by the patient are an established and well recognized part of medicine for a long term. Apart from e.g. back pain, cardiovaculatory dysfunction, and intestinal dysfunction, a psychosomatic component can play an important role also in Dry Eye Disease, as confirmed by many studies. When the disease becomes the main concern in daily life this may suggest that it could be useful to seek the help of psychosomatics. How do we GET Dry Eye ? ... Why does Dry Eye Disease tend to GET WORSE ? => Tear Film Deficiency with decreased wetting of the tissue and Tissue Damage negatively influence each other in self enforcing vicious circles and lead to progression of disease ! Inflammation is an important mechanism for worsening of Dry Eye Disease. Inflammation is a basic protective mechanism of cells and tissues against wounding and destruction, as typically occurs in Dry Eye Disease due to tear film instability and increased friction. Inflammation initiates destructive mechanism in order to overcome the ´destructor´ and is later followed by tissue repair. When inflammation becomes chronic, however, it transforms into a negative and destructive process because the initial destruction can not be followed by a sufficient repair. In chronic diseases like Dry Eye Disease, the chronic tissue wounding may lead to a chronic inflammation that drives some vicious circles and can thus greatly enhance the disease process. Dry Eye Therapy to interrupt the vicious circles in Dry Eye Disease may then include an anti-inflammatory therapy for a limited time in addition to a sufficient Tear Supplementation and Eyelid Therapy . When is a Dry Eye a ...DISEASE ? => When ´Dry Eyes´ become chronic an occasional condition of ocular dryness can turn into a disease !